Homeloanodisha.com is a leading property management and home loan consultancy firm in Odisha, India. This company is working with experts in the loan professionals and investment advisors to assist you in the purchase of the land and investment products. 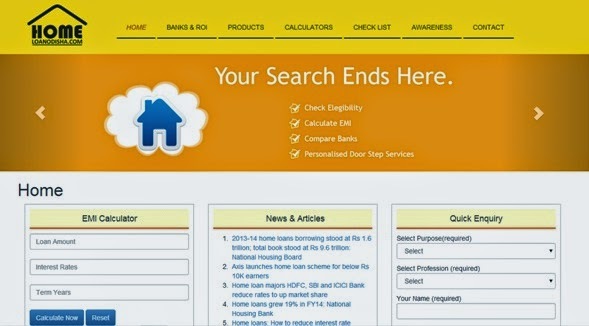 This website provides many important categories like Banks & ROI, Products (Home purchase loans, Home construction loans, Site purchase loan, Composite loan, Loan against property, Home improvement loan, Loans against rent receivables, Product loan and Personal loan), Calculators (EMI calculator, Amortization calculator, Tax benefit, Estimate calculator and Area conversion calculator), Check list (Salaried, Individual, Self employed Prof./ Non Prof., NRI/ PIO and Corporate Browser) and Awareness.